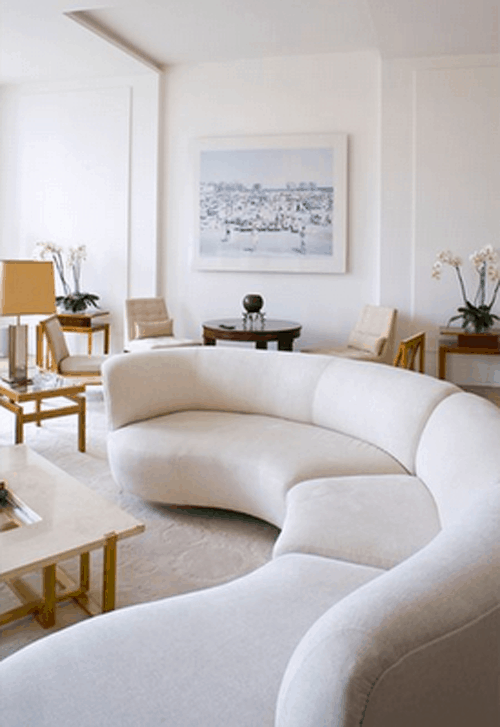 Create a scene in the living room with a furniture piece that becomes an instant focal point. 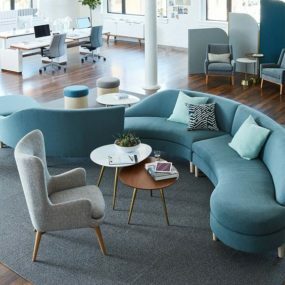 If you’ve got the space, one of these 20 round couches will steal the show in all the right ways. Just take a look at how they transformed the spaces below! Whether you’ve got a modern vision or one with an industrial appeal, you’ll want to peek at these designs for inspiration. 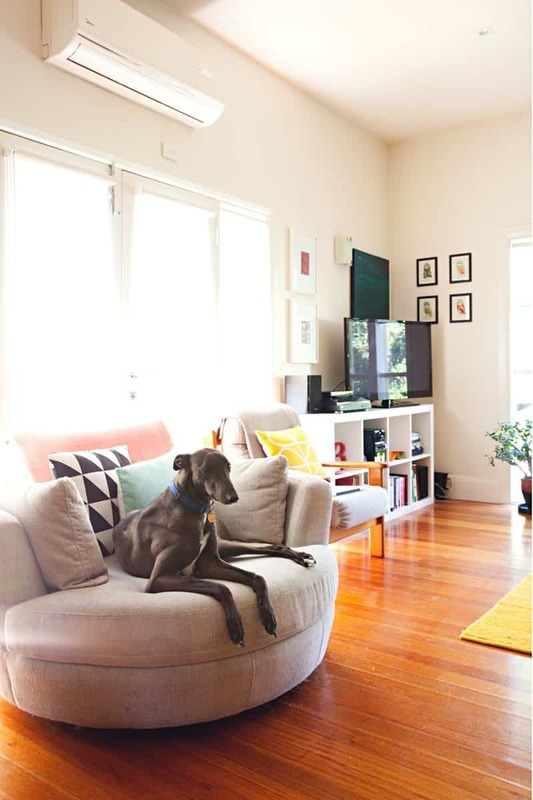 SF Girl By Bay uses round little sofas and ottomans to create a beautiful scene inside the home. The velvet and sage green tone make it both unique and elegant. Add plush pillows and you’ve got a fun spot for both the family and guests to enjoy. Go with something both bright and statement-worthy. 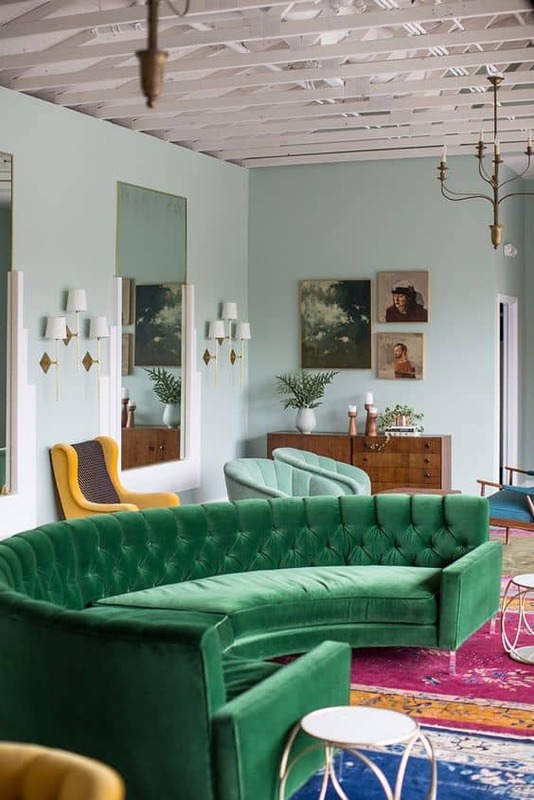 A velvet, tufted and rounded sofa dipped in a gorgeous shade of emerald can really transform the home. Thanks for the inspiration My Domaine. 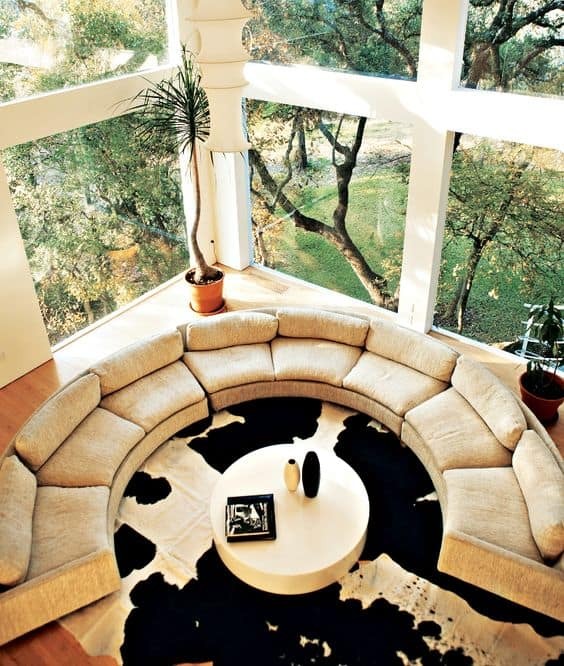 NY Times featured this gorgeous room and we couldn’t help but snag it and feature the rounded sofa on here. The blue is gorgeous, the texture is plush and we love how many visitors can enjoy the space as well. 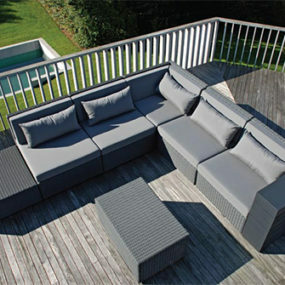 If you’ve got a big enjoy area then why not grab a piece of furniture that’s a bit outside-the-box? We found this sterling piece over at Snake Ranch and immediately fell in love. 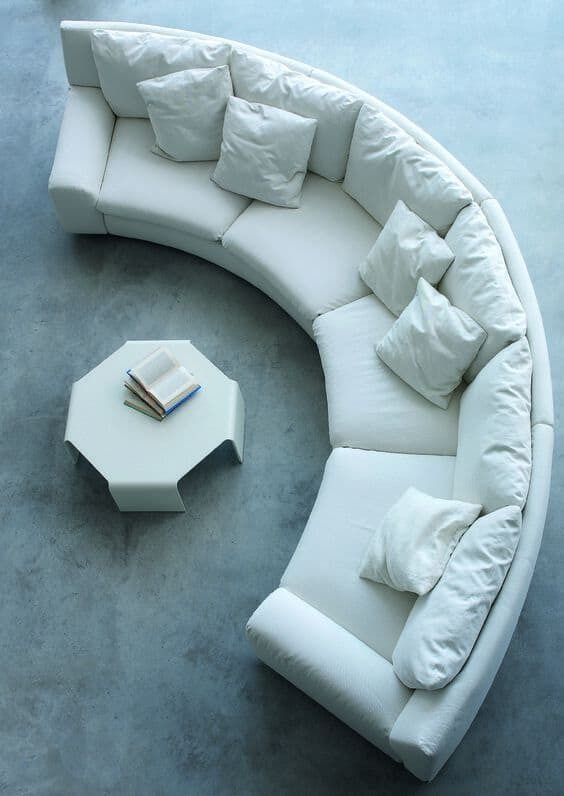 It’s elegant, it’s curved and it’s sleek around the edges making it a great choice for more contemporary homes. This is a beautiful addition to a large home office or a formal sitting area. Thanks to Pinterest, we got a bit more traditional inspiration to share. 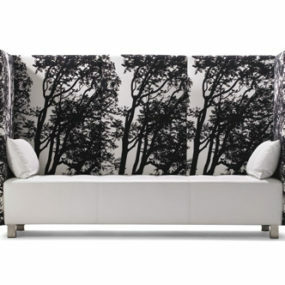 This fabric piece is a great addition to a family home and modern space. 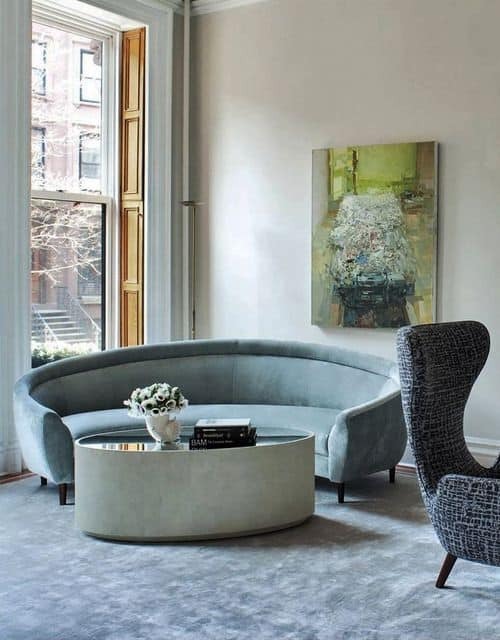 We also love how the curved sofa table was paired with the rounded sofa creating a unique and sleek look. 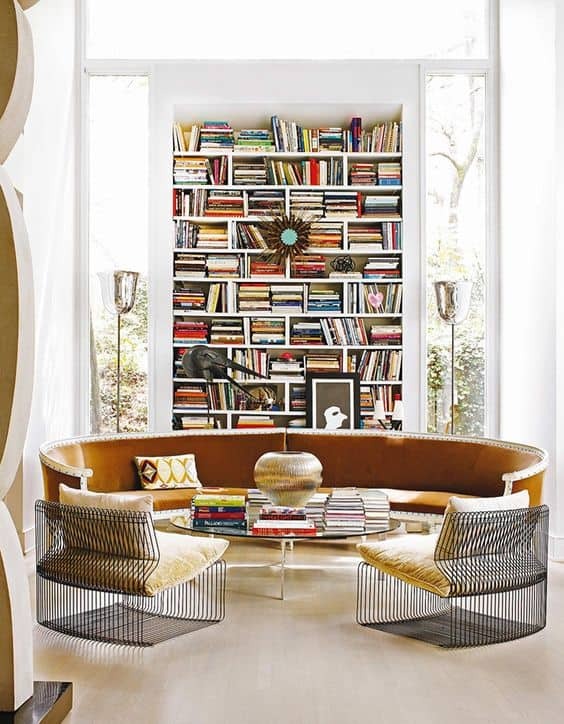 Homedit featured this beautiful library but we, of course, couldn’t take out eyes off of that amber sofa in the middle. 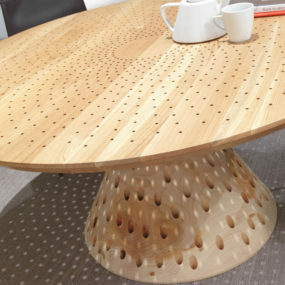 Rounded choices don’t have to be chunky, instead, you can find a piece with softer, more delicate legs and lines. 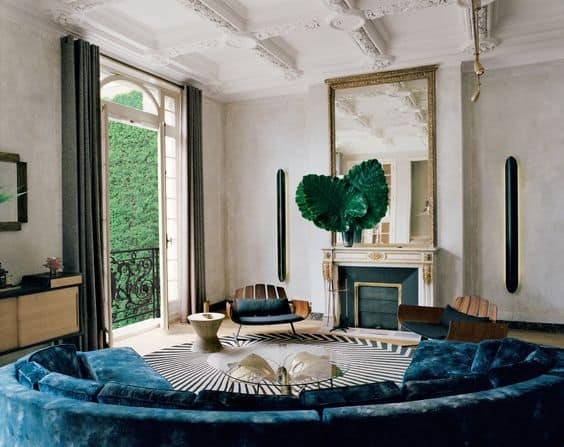 If you’re looking for something more luxurious or feminine, check out this space from Architectural Digest that allows a purple, round sofa to take centerstage. 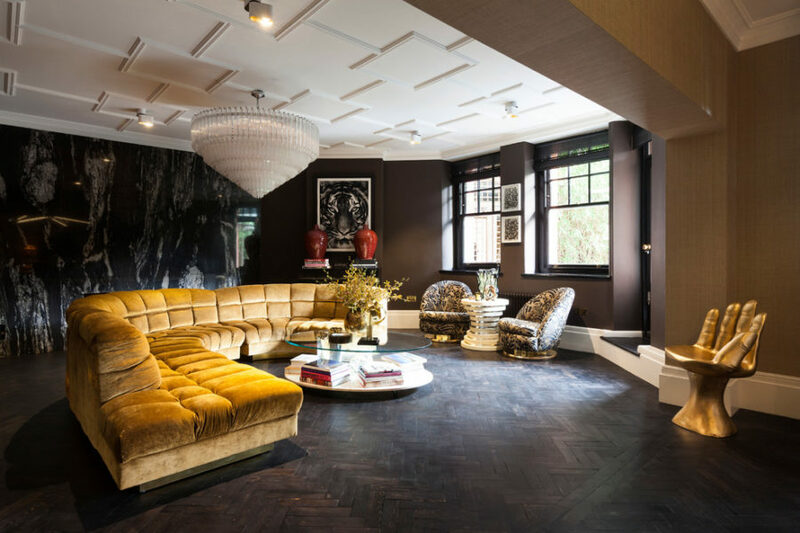 Pair it with eclectic pieces or those with a bit more gild and glamour. The chandelier on top and the animal-inspired area rug on the bottom is such a fun combo. Meta Interiors has this curved beauty on board. 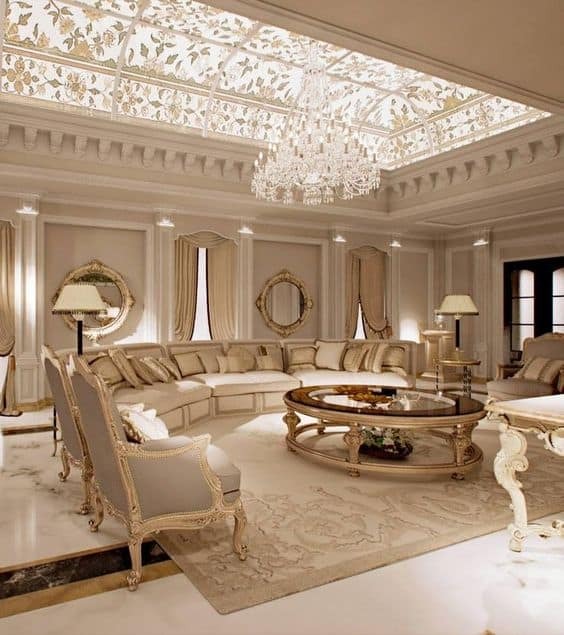 We love its simplicity and neutral tone. 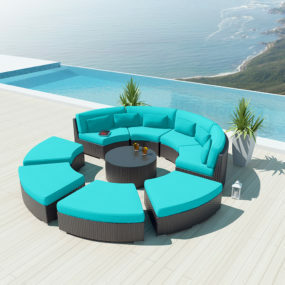 But the best part about this round sofa is the versatile it has to be paired with a multitude of different interior designs genres and colors. AD Magazine has this little beauty sitting, waiting to be scooped up. We love its versatile, charcoal finish but it’s compact design also makes it a great choice for a variety of corners around the house. From the home office to the master bedroom, you’ve got a sophisticated and stylish seating idea right here. Thanks to Pinterest again we found a softer, more plush example to show off. This design is also quite versatile and could potentially fit into a variety of different styled homes and be paired with lots of different colors. but our favorite part is how comfy it looks! 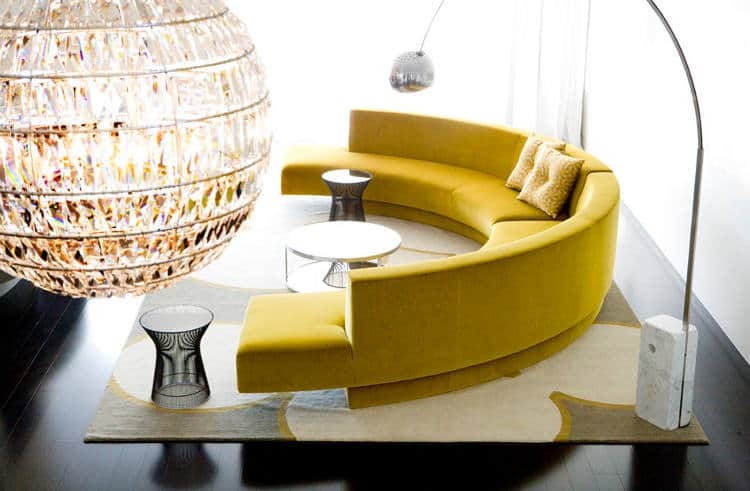 A favorite design of the bunch, this golden mustard round sofa is quite stunning. Desire to Inspire shows off how you can make the perfect piece of furniture the focus to your space. It’s both functional and a piece of art inside the home. 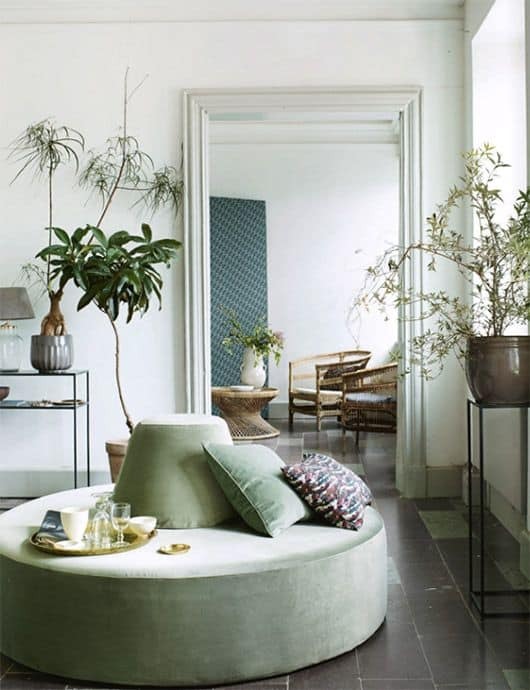 Homedit has a great mix of inspiration, ideas and decorating tips, and fortunately we found this gorgeous, traditionally-styled round sofa there too. It looks comfortable for afternoon naps with the family but also chic enough to impress your guests with. 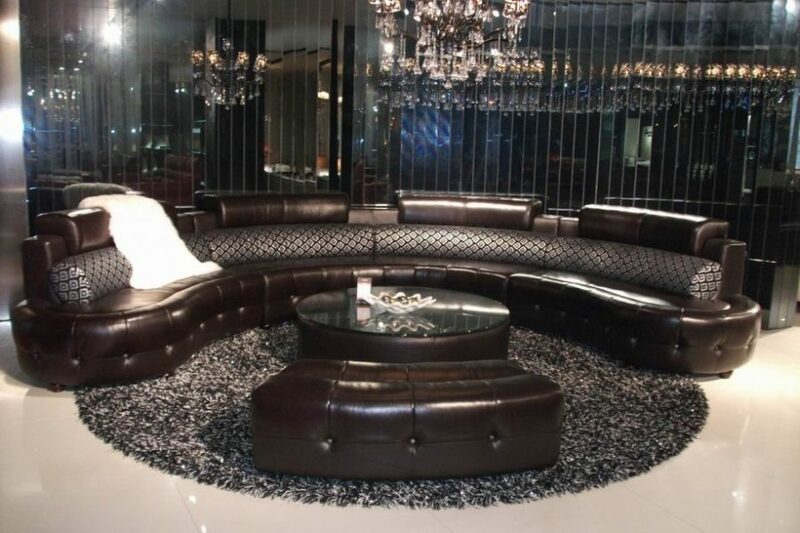 Homes DIR showcased this edgy, more masculine sofa design. 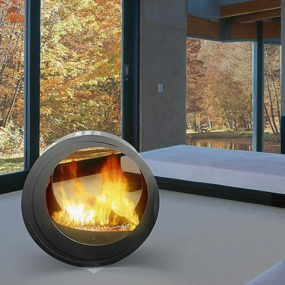 It too is curved and will fit inside a home that’s modern in style. 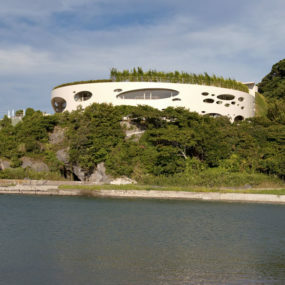 If you want to go with a more mysterious vibe, this is something you’ll want to take a look at. 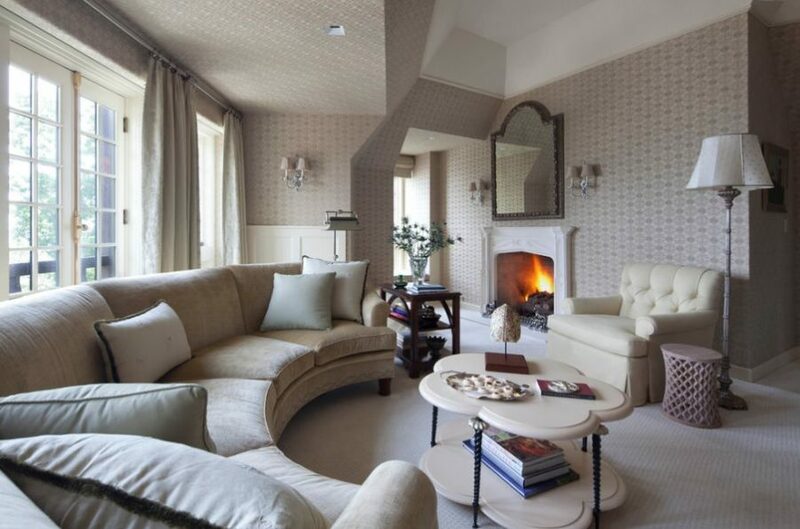 Here we have a small round sofa with Apartment Therapy that’s a bit more on the traditional side as well. 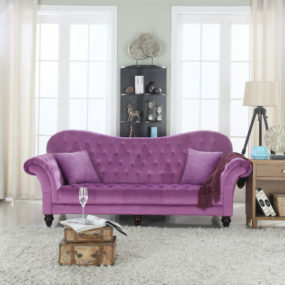 Mix it with fun colors and use it for extra seating in the corners of your home. 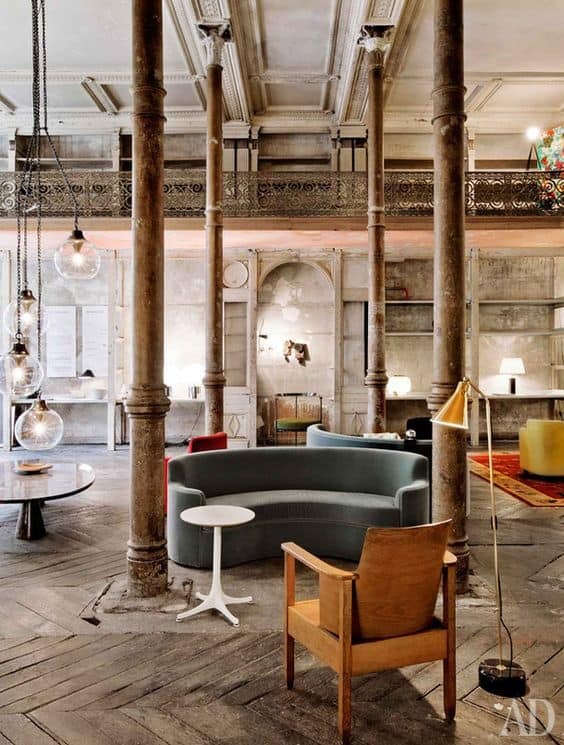 It can be both family-friendly and eclectic! Pinterest is full of great inspiration. And thankfully they gave us this gorgeous room to dive into. From the black and white area rug to the open, round and extra-large sofa, we love the neutral tone as it plays off all of the natural sunlight in this spacious living room.